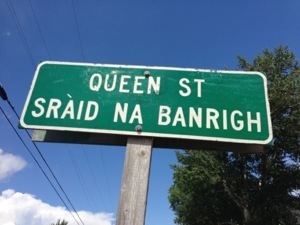 I forgot to mention that Pugwash is bilingual – all their street signs are in two languages – English and Gaelic! We thought we might have been stuck in Pugwash for an extra day because the marine weather was showing all sorts of wind last night, but when we got up this morning, the forecast had changed and we sailed off for Borden, PEI. 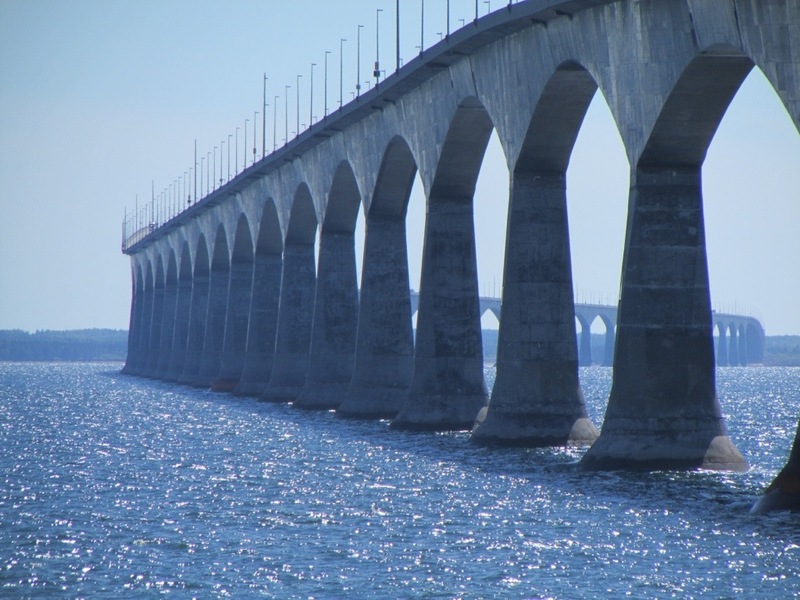 Borden is right near Confederation Bridge so I was able to get some good pictures of it. 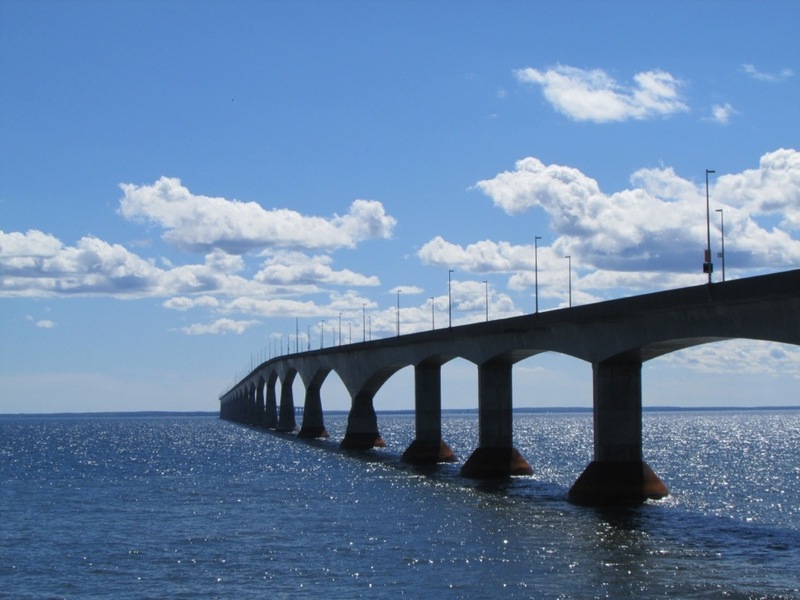 The Confederation Bridge is the longest bridge in the world that has ice covered water. It is 12.9 kilometres long and took more than 10 years to build. If you are interested in crossing, it costs $44.50 for a normal car (two axle) and each additional axle is $17.75. This is for a round trip – they only charge to get off the island! Cyclists and pedestrians most take a shuttle to cross over. So, we wandered around Borden this afternoon and I got a good walk in. We are anchored in the harbour where the ferries used to dock, so it is very protected. Now, it is a bit smelly as the mussel plant is dumping its waste into the harbour, but it is safe and we are leaving tomorrow! I had a good laugh though, after we discussed the condition of the harbour and said that if Dennis fell in, he would not be allowed back on the boat unless he were sanitized. Then, we saw a man swimming in it! I kept thinking that he must have fallen off of his boat as he was only swimming from one side of the wharf to the other, but still! I hope he takes a good long shower! Now, the funniest part of today was that when we were walking around Borden, there is a big touristy spot with lots of shops and information. Well! 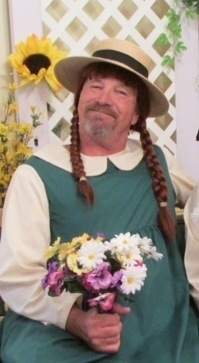 You can get dressed up as Anne of Green Gables and get your picture taken, so of course we did! Since I am in charge of photography, I cropped out myself (you never know where these pictures will end up!). Here is Anne after a rough day at sea! Please give your best comments for this picture! We are headed to Summerside tomorrow – hopefully the good weather will hold! Lovely look with the long locks, Dennis! I have never seen a more charming Anne . Are those real flowers? It looks to me like Anne needs a shave pretty soon. Those hands look like they have been doing more than just reading books. The rest of the photo could fool me though.